Strategy development and identification of key performance indicators are the most important stages of BSC development. Balanced scorecard project cannot be just purchased and implemented within several days. Balanced scorecard should become a part of everyone’s work otherwise this system will never bring any positive results. The problem is that very often balanced scorecard is developed by several or even one of top manager. There is nothing wrong that top managers are charged with development of key performance indicators and balanced scorecard. These people know much about the company there working for and chosen strategy. It turns out that balanced scorecard and strategy maps developed by company top manager meet all requirements and norms of BSC. But the problem is that in such a case balanced scorecard is used by a dozen of people in the company. Even if these people really believe in the power of balanced scorecard this revolutionary strategic management tool will never work since it will mean nothing to ordinary personnel, heads of departments and business units etc. Just to the contrary, balanced scorecard may cause resistance and opposition from personnel since employees will consider it to be just another tool to control them. That’s why it is extremely important to initiate a broad discussion of balanced scorecard. Even if ordinary employees lack strategic management knowledge they can still offers some creative ideas as to internal business processes and generally everything happening on the operational level. Top managers can think in the long term while head of departments can tell much about company customers, market segments, customer demands and requirements. Before implementing balanced scorecard and developing a set of key performance indicators top management of the company should understand that successful implementation of balanced scorecard can mean drastic changes in the company. If organization is not ready to change balanced scorecard will be helpless and useless. Moreover top management and company personnel should start such changes with themselves. Previously used methods of management will not work with balanced scorecard. 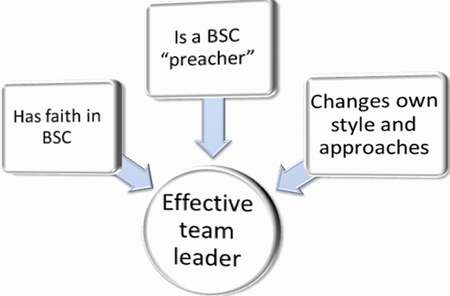 The company must learn to live with BSC but not just use it as a popular managerial tool. It is not a project that has certain terms for implementation. Once implemented balanced scorecard is either rejected by the company or stays in the organization forever. So, in other words, it even works but doesn’t work. Preparation for BC implementation is perhaps the most important stage, that’s why company should carefully select people will be in charge of BSC development.